Alnwick sofa in Mulberry Home velvet with leather arms, hardwood frame, serpentine sprung seat, walnut turned legs and hand-studded arms made in the UK. Dining range Brunel combines a chalk oak finish with gunmetal to create a contemporary look. Choose between a fixed or swivel dining chair, elliptical or rectangular dining tables and flexible storage, all with a 45-degree oak veneer pattern on the cabinet fascias. Emerging designers, art, cushions, photo frames, mirrors and clocks. 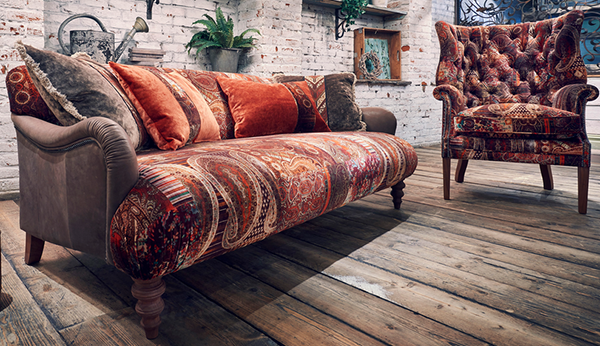 Choose a new look and relove your upholstery. See the transformation. 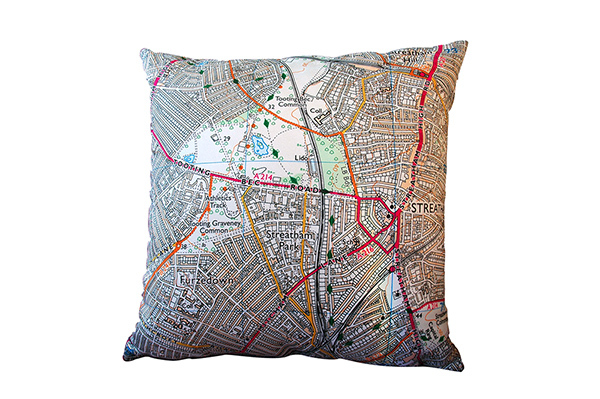 We have an exclusive range of home accessories based on Ordnance Survey mapping of our area. Locate your road, the Commons or your favourite landmarks on mugs, cushions, trays and cards. All beautifully made in Britain. 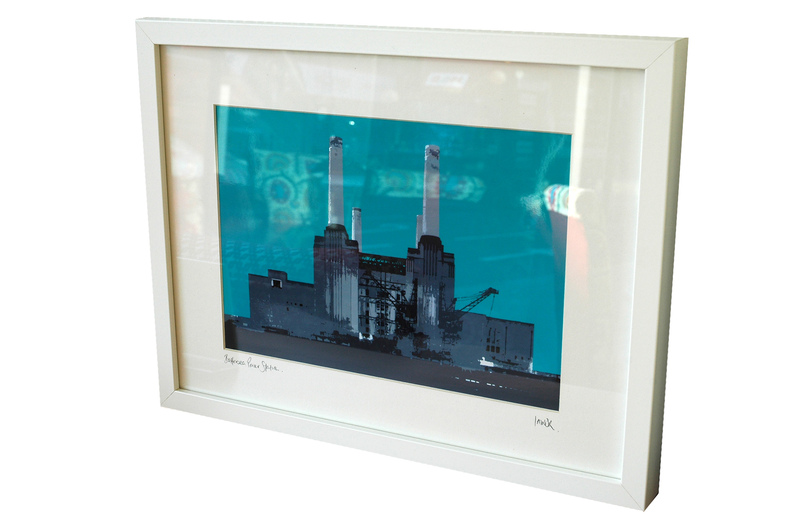 Images of London landmarks including Battersea Power Station and Clapham bandstand from local artists. We have British made mugs, cushions, trays, cards, wall art and even a deckchair celebrating our local area. OS map featuring Tooting, Balham and Streatham. Embroidered linen, feather-filled cushions in various colours commissioned by E & A Wates. British made. One hour guided tours of E & A Wates furniture restoration workshop can be arranged for small groups. Working with beautiful pieces of furniture from all periods we show you our restoration process. Meet the craftspeople involved and see their skills at work. Please contact us to arrange a guided tour. From an antique chaise longue to a French rocking chair you'll get to understand the materials we use including horse hair and traditional coil springs. Split timber, missing veneer and precious inlay are daily challenges, find out how we deal with them and the perils of woodworm. Enjoy furniture being brought back to life! We remove fading, ring and water marks and stain new timber repairs to blend in with old patination. Fine gold and silver leaf is applied to create and repair beautiful mirror and picture frames and decorate fine furniture. From a bergère cane chair to an Arts and Crafts rush seat the beauty can be restored. E & A Wates take part in the Decorative Fair, London, with live crafts demonstrations. 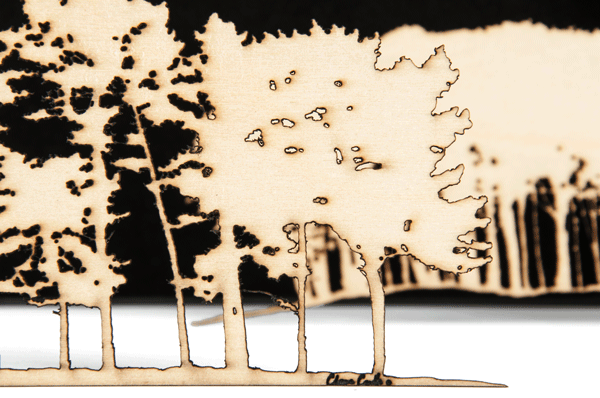 We usually have a small number of complimentary tickets at our showroom prior to the Fair. Save the date. Take a virtual tour of our furniture showroom, interior design library and restoration workshop. Contact us for a free informal consultation. Coordinate your scheme from our huge selection of wallpaper and carpet samples. Advice on curtains and blinds, cushions and headboards, made-to-measure. French polishing, caning, rushing, gilding and furniture repair. Revive favourite furniture from the frame up. Live demonstrations by our furniture restorers can be arranged. More details. Find restored gems on sale here, reconditioned vintage and mid-century furniture for sale in our showroom. 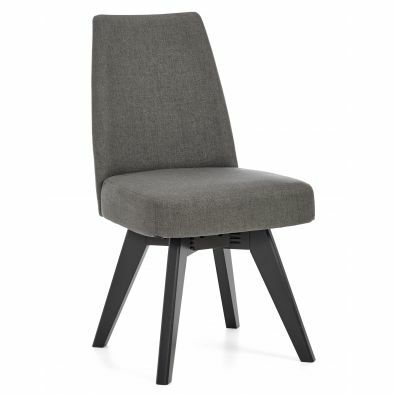 Deco chair £1495. The E & A Wates story from 1900 to the present day. Filmed in our workshop one-minute videos. Photographs are subject to copyright, supplied to E & A Wates with permission and not to be copied or reproduced.